The WISMEC Presa TC 100W is a new member of Presa series. It supports VW, Bypass, TC-Ni, TC-Ti, TC-SS316 and TCR modes. Besides upgradeable firmware, magnetic back cover and new display interface, the Presa TC 100W also features is compatible with 26650 or 18650 cells (Not Included). 100W Max Output with TC System. Replaceable 26650/18650 Cell & Magnetic Back Cover. Stainless Steel 510 Spring Loaded Connector. Size (H*L*W): 93 x 46 x 30 mm. Thread type: 510 spring loaded. Cell type: High-rate 26650 cell (Not Included – Discharge current should be above 35A). High-rate 18650 cell with the help of battery sleeve (Not Included - Discharging current should be above 25A). Resistance range: 0.05-1.5ohm for TC modes. 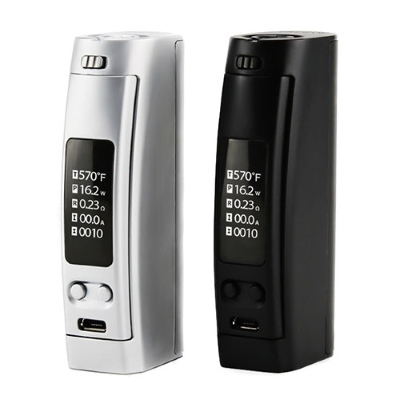 Presa TC100W Mod (Battery Not Included).